occur. Likewise, you require a second application over uncovered areas. Various types of foundations are used in the construction industry today. Because of space limitations, let's consider only two of the main types - mat foundations and spread footings. The mat (raft or floating) foundation is a continuous footing that supports a reinforced concrete slab covering a minimum of 75 percent of the total area within the exterior walls. It is normally used when the subsoil is not considered good enough for spread footings. Mat foundations may take the form of a hollow concrete box with intermediate walls or columns to permit taking advantage of the weight of the earth removed in the excavation to offset, in part, the load imposed on the mat foundations. When inspecting, you must make sure that the subgrade is carefully leveled to the specified elevation so that the concrete will be of full thickness and that special sand or gravel is spread and compacted if called for. Be alert to detect any wide variations in the quality of the subgrade. Figure 6-8. 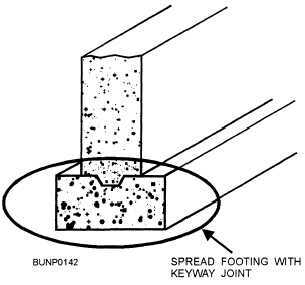 - Spread footing with a keyway joint. concrete retaining wall is placed on a 16-inch footing. Spread footings are designed for a definite load per square foot, based on prior investigations of the site, or on general knowledge of the characteristics of the soil in the area. Usually, the drawings indicate both the sizes of the various footings and the load on which they are based, normally twice the size of the foundation wall. Your primary function is simply to make sure the footings are the correct size, with satisfactory concrete reinforcement, or other parts, as shown or specified. However, be alert to detect any significant variations in the quality of the substrata from that indicated by boring records or assumed designed loads. It is essential that anchor bolts be set with the utmost accuracy relative to both position and level. Errors discovered after the concrete has set are extremely expensive to correct. This is particularly vital when sleeves are not specified or permitted to allow for lateral play. Anchor bolts are usually set to a template, which is carefully aligned with the building lines and leveled to a definite elevation. You must check the setting and verify beyond question that the template is accurate within permissible tolerances before permitting concreting to proceed. Check the templates periodically during the course of the work to make sure they have not been disturbed. Pay particular attention to the bolt settings to make certain that there is sufficient thread exposed above the top of the steel base plate to permit full engagement of the nuts without excessive projection of the threaded bolt. You must also make sure that the anchor bolts are provided with hooks, L-bends, swaging, or other anchorage devices, as shown or specified. When sleeves are specified, you should make sure that the bolts are centrally located in the sleeves to provide leeway in adjustment in all directions. Ensure that the sleeves are NOT installed in such a manner as to decrease the holding power of the bolts. Later, take care to make sure that the sleeves are properly filled with grout, lead, or sulfur, as the specifications may require, after the steel has been erected and aligned. Concrete floors may be built on the ground at grade or on well-reinforced overheads. Structural concrete floors may be of flat slab, beam and slab, beam and girder, or steel decking.